Welcome to Velvet Green Creations Website, your source for fine art, digital services, WEB design, marketing, photos, and more! We furnish clients and collectors from around the world with a variety of art services: original fine art paintings, stone sculptures, fine art prints, graphic design services, business logos, photography, stock photos, web design, & animation. All fine art prints on sale! »Click here to view and buy prints. With two aspiring young artists as children, we like to say that art is a big part of our family way of life. 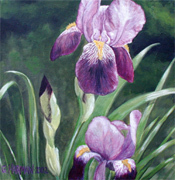 Photo below is "Purple Iris" Flower Painting by Gina Harman. The photo to the right is "Fall" by Gina Harman. This painting is part of a very special collection. 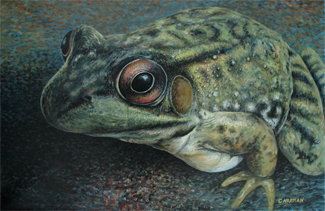 It is one of a series of paintings involving my friend "Bill". 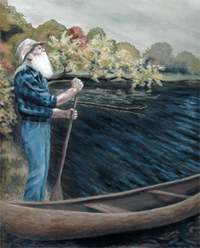 Bill inspired a number of paintings that will focus on spirituality and our seasons of life. Whales, fish, and an occassional tombstone. Although this art form has been temporarily retired, we do like to show the stone sculptures of Chris Harman. Here is a fine example of "Sperm Whale" sculpted into Lithographic Limestone. His work is collected around the world and can be seen in galleries. Velvet Green Creations features Whale Artist Chris Harman who has captured these amazing creatures within their family "pod" traveling through their oceans of time. BUY FINE ART PRINTS OF OUR ART! Portrait work / human form art available through Velvet Green Creations. Although we paint human form, we do not offer commissioned portraits at this time. All fine art prints on sale! »Click here to view and buy prints. Painted from flora found throughout my property, these tender Flora Paintings of Flowers, Plants, and Trees are some of my most enjoyable to paint. Flowers are one of my favorite items to paint. This Children's Book illustration was created for the childrens book, "Pond Friends" that we hope to self-publish in the future. Over 200 web clients from small business to large organizations. Top designs by Velvet Green, superb marketing, optimization and CMS Driven programming. "We enable our clients to update their own websites, add new pages, and much more! 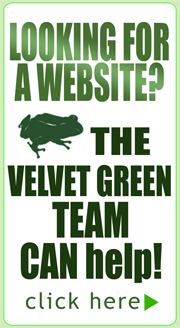 Visit our Velvet Green Energy Links for great information, news and ideas - Learn about why we have a Frog Logo?